We released Timbeter Container over a year ago and the main motivation for that was the growing demand for optimizing timber export when loading shipping containers. Since there was a constant need for proof of what’s inside the container and the claims with the buyer could not be solved, we developed a solution, that would enable the seller to count each and every log in the container and systematically sum up the volume if needed. All of the pictures are uploaded to the Container module and are saved in the hierarchy where we have containers, that belong to a bill of lading. From there you can generate tally sheets for the container, have reports for the bill of lading and even generate a shareable link for the bill of lading and/or container that grants the view-only rights to the third party. The common question that is being asked when discovering our solution is to do with the volume measurement. How do we measure volume if the log ends are mixed? 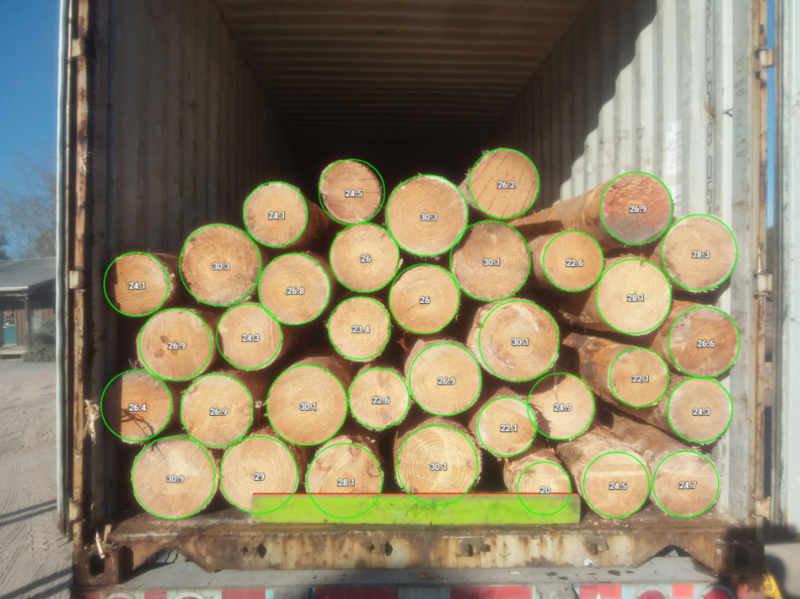 While it’s true, that we only measure what we see and we cannot detect if the log end is the smaller or larger one, then there are a few options to implement when loading the container. The use case is fairly simple – all logs are racked up one way and before pushing the pack all the way inside you make a picture with Timbeter Container to measure it. You do not have to measure the logs right away, that can be done afterward or even in the office for the sake, that yard operators could just carry on loading. PS! Be advised, that this will only work if the taper is not too high otherwise you might damage the container. If you are using a sled to push in the logs and you have an option, that the smaller ends are marked in a clear way (for example with tags or harvester spray paint), then you could capture a picture from both sides and delete the logs, that do not have a mark on them. All editing can also be done later in the office and thus, capturing the images is a fast process. Timbeter Container has a feature, that enables you to detect QR-codes that start from the size of 10 x 10cm. Tags can be attached to the logs whenever during the process, you simply capture an image of the pack from one or both sides and use the QR function to detect the tags. If there are any missing you can either detect separate tags using our single QR code detection feature or you can manually enter the missing tags online. This scenario could be applied to both previous options. It is worth mentioning, that when capturing an image be aware of the lighting conditions and check if all the QR codes are clearly visible on the captured image. As mentioned before all measurements are uploaded to the container module and stored in a systematic hierarchy. You can have as many pictures under one container as needed. All the volumes and logs are summed up for easy review on the dashboard. So, if you’ve had any doubts or questions that you just didn’t have time to ask, then hopefully this post answered most of them. This solution will save you time, enables you to load more containers at a time and give you hard evidence of what was loaded inside the container.